Mastery in computing means acquiring a deep, long-term, secure and adaptable understanding of the subject. It is demonstrated by how skillfully a child can apply their learning in computing to new situations in unfamiliar contexts. A positive teacher mindset and strong subject knowledge are key to student success in computing. iCompute aims to enhance students’ enjoyment, resilience, understanding and attainment in computing by empowering and equipping schools to deliver a world-class computing education with comprehensive computing schemes of work that are designed for computing mastery. Every child can enjoy and succeed in computing when offered appropriate learning opportunities. 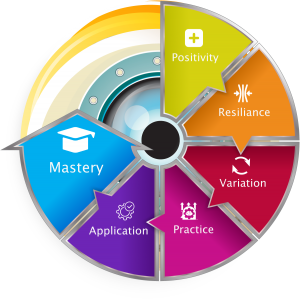 iCompute uses growth mindset and problem-solving approaches that enable pupils to develop resilience, persistence and confidence. All children are encouraged to believe in their ability to master computing and are empowered to succeed through curiosity, tinkering and perseverance. Pupils are taught through whole-class interactive teaching with pupils working together on the same lesson content at the same time. Concepts are developed in logical steps with particular attention given to fundamental concepts. This ensures that all children can master concepts before moving to the next stage, with no pupil left behind. Pupils are given the time and opportunity to fully understand, explore and apply skills and ideas in different ways, in different situations and in different subjects. This enables pupils to fully grasp a concept and understand the relevance of their learning. 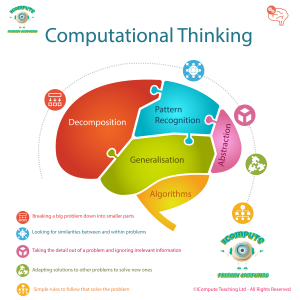 Developing computational thinking lies at the heart of the National Curriculum for Computing and involves learning how people solve problems; changing what looks like a difficult task into a simple one that we know how to deal with. It involves taking a problem and breaking it down into a series of smaller, more manageable parts (decomposition). Each part can then be looked at individually, considering similarities between and within other problems (pattern recognition), and focusing only on the important details whilst ignoring irrelevant information (abstraction). Next, looking for solutions to other problems and adapting them to solve new problems (generalisation). Then, simple steps or rules to solve each of the smaller problems can be designed (algorithms). Once we have a working solution, we then use (evaluation) to analyse it and ask – Is it any good ? Can it be improved? How? 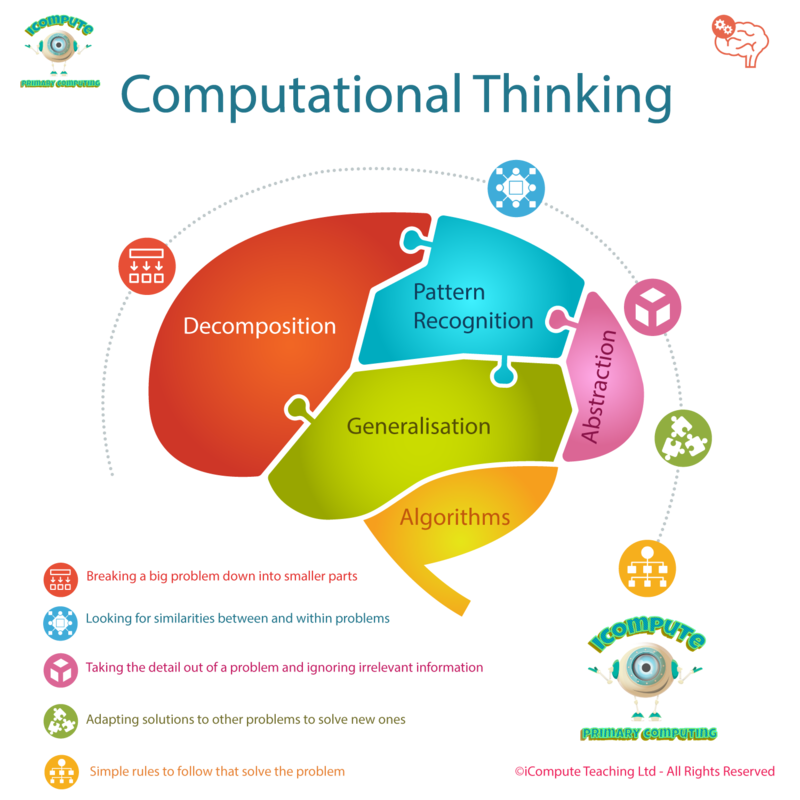 Computational thinking is developed by embedding these skills into all of our lessons, through teacher modelling and with targeted questioning. The judicious use of activities away from devices and computers (unplugged) are crucial to young children’s learning in computing. Our unplugged activities are physical in nature and provide kinaesthetic experiences which help pupils understand abstract concepts and deepen learning. Having activities away from computers is effective as children know that computers are a tool in their learning, rather than the subject itself. Stepping away from computers enables them to think about concepts and teachers can convey fundamentals that are independent of particular software or technology. What children learn in the unplugged context must be applied to another (plugged: using technology) which supports our other principles of mastery: success and depth. 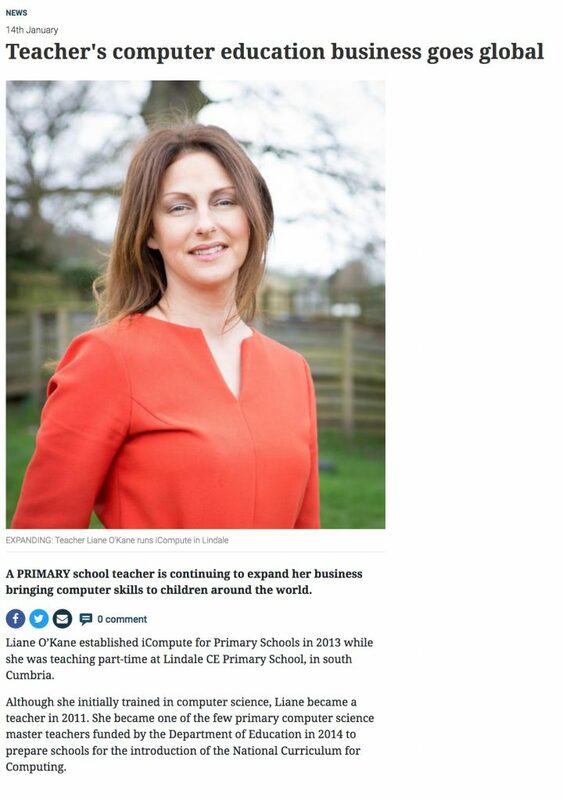 Since the introduction to National Curriculum for Computing at Key Stage 1 and Key Stage 2 in England 2014, it has been a child’s statutory entitlement to a computing education from the age of 5. There have been many challenges along the way since 2014 for primary teachers, not least, due to the subject being introduced throughout schools where the vast majority of teachers had never been trained to teach it. Despite a number initiatives to improve teacher subject knowledge, notably driven by Computing At Schools (CAS) and the Network of Excellence (a grass-roots organisation I represent as a Computer Science Master Teacher) the Computing Education Project Report (The Royal Society, 2017) – exploring the issues facing computing in schools – concludes that computing education across the UK is ‘patchy and fragile’. There is much to address in a system where many teachers do not feel confident teaching the subject and are in need of significant support.